Tattoo removal is a procedure done to remove an unwanted tattoo. Some common techniques used for tattoo removal incorporate laser surgery, surgical removal and surgical dermabrasion. Laser Removal – This methodology uses lasers to separate and break the ink particles to smaller ones with the goal that it can in this way be removed by the circulatory system. 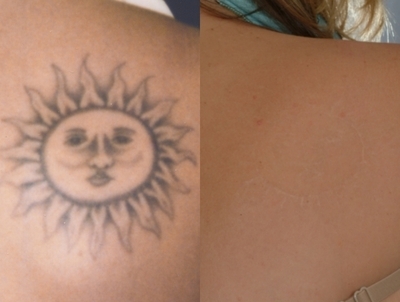 Laser removal by Q-switched Nd-Yag or ruby laser energy is the most current innovation available in removing a tattoo. It is the most secure tattoo removal technique and is considered the least painful method. It is necessary that the patients are required to visit the cosmetic surgeon or cosmetologists many times to have the tattoo completely removed. Laser removal works by heating the tattoo pigment simply enough so that the skin can retain it. The laser is applied in very short pulses so abstain from harming the surrounding skin and causing smolders and scars. Surgical Excision – As the name proposes, the surgeon will remove the layers of skin with the tattoo and after that close the wound with stitches. Sequential excision: For larger tattoos; surgeon may excise the tattoo in 2-5 sittings depending upon the width of the tattoo and is sutured. Gap between two sittings is usually 3-4 months. Skin Grafts – Skin Graft can also be used to cover the tattoo however that does not give cosmetically appealing results. What should you not do for tattoo removal? All these methods lead to permanent scarring of the skin thus making the removal of tattoo difficult. The risk of complications is very rare for this procedure. Scarring and pigmentation hypo or hyper issues are the most well-known of the issues associated with this procedure.